An essential resource for building and maintaining an effective leadership team, this book gives HR professionals and I/O practitioners a greater understanding of executive dynamics, development tools, and proven techniques for managing executives. Written by top-notch practitioners, this volume explores executive performance and documents unique to executive-level human resource applicaitons. It shows how effective executive performance is qualitatively different from that of middle level managers. It also outlines today's state-of-the-art corporate human resource practices, along with lessons learned, and provides guidelines and principles related to effective executive practices. Rob Silzer is the managing director of HR Assessment and Development, Inc. For more than twenty-five years Silzer has consulted with managers and executives from more than one hundred organizations. He has specialized in executive and management leadership, team selection and development, and strategically driven HR systems. Silzer is the coeditor with Richard Jeanneret of Individual Psychological Assessment: Predicting Behavior in Organizational Settings. Part One: Defining Executive Effectiveness. 1 Deciphering Executive Failures (Jeffrey A. Sonnenfeld). 2 What the Best Business Leaders Do Best (Anthony J. Rucci). 3 Understanding the Personality of the Executive (Leslie Pratch,Harry Levinson). Part Two: Managing Executive Resources. 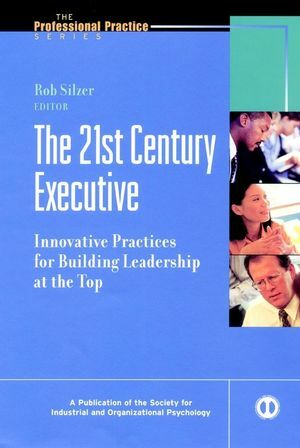 4 Selecting Leaders at the Top: Exploring theComplexity ofExecutive Fit (Rob Silzer). 5 Leveraging Executive Teams: What s New (andWhat s Not) in theStrategic Enterprise (Janet L. Spencer, J. Carlos Rivero, David A.Nadler). 6 Coaching Executives: Individual LeaderDevelopment (George P.Hollenbeck). 7 Developing Executives (Val H. Markos). 8 Rewarding Executives (Marianna Makri, Luis Gomez-Mejia). Part Three: Understanding Executive Perspectives. 9 Finding the Key to the Executive Suite: Challengesfor Women andPeople of Color (Karen S. Lyness). 10 E-Executives: Leadership Priorities for theNew Economy (D.Douglas McKenna, Robert B. McKenna). 11 Growing Global Executives (John R. Fulkerson). 12 Getting an Executive View: An Interview witha Chief ExecutiveOfficer (Lawrence A. Bossidy, Marcia J. Avedon).